Prime Minister Theresa May is pictured in her hotel room as she prepares her conference speech that she will deliver to her party's annual conference, tomorrow, in Manchester Central conference center, in Manchester, Britain, October 3, 2017. MANCHESTER, England - Prime Minister Theresa May will tell her Conservative Party on Wednesday it is not her style “to give up and turn away” when things get tough, trying to persuade critics she can lead Britain and secure a strong Brexit. 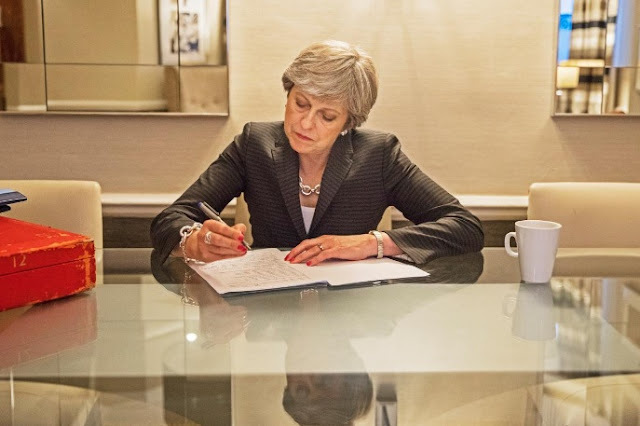 Striking a more personal tone, the 61-year-old May will describe her political drive to try to win over and rally a party that is disillusioned by rifts in her top team of ministers and by a June election when the party lost its parliamentary majority. In a speech to the party faithful at their conference when May will unveil a plan to build more homes, the prime minister wants to reset her agenda and assert her authority after coming under pressure from her foreign minister Boris Johnson over her plans to leave the European Union in March 2019. Her address could be make or break for the prime minister, whose attempt to present a united front at the conference has been undermined by Johnson, a possible leadership contender who received rousing applause for his speech on Tuesday. Calling on the party to concentrate on voters instead of its internal wrangling, May will say she was in politics “to make a difference. To change things for the better. To hand on to the next generation a country that is stronger, fairer and more prosperous”. “None of this will be easy. There will be obstacles and barriers along the way. But it has never been my style to hide from a challenge, to shrink from a task, to retreat in the face of difficulty, to give up and turn away,” she will say, according to excerpts of the speech. The run up to May’s speech, however, was overshadowed by Johnson who once again dominated the airwaves after he stunned some party members at the conference in the northern English city of Manchester by saying Libya could become a new Dubai if it could clear the dead bodies away. Again there were calls for Johnson to resign or be sacked, demands that May had hoped had been put aside after the foreign minister pledged his loyalty to her after setting out his own Brexit plan in a local newspaper. May must also contend with a resurgent opposition Labour Party which accuses the government of mismanaging the economy and worsening social divisions. She and her ministers have sought to depict the Labour leadership as dangerous Marxists. One senior Conservative said May must show “personality, vision and confidence” in her speech and offer “delegates hungry for ideas” something new. Her deputy, First Secretary of State Damian Green, said May wanted to take the focus away from what he described as “a lot of drama” this week and onto helping people with their daily lives. “What you will hear today from the prime minister is a very personal statement of the lessons she’s learnt from the election and what she derives from that in terms of what the government needs to do in the months and years to come,” Green told the BBC. Prime Minister Theresa May will tell her Conservative Party on Wednesday it is not her style “to give up and turn away” when things get tough, trying to persuade critics she can lead Britain and secure a strong Brexit.